Hello everyone and welcome to the #MyGloriousGardens August Linky Party! Wasn’t July’s weather incredible? It was boiling hot and very dry here in Wiltshire. It looks like the rest of this week is going to be hot again after a weekend of cooler and wetter weather. The garden almost cried with joy at seeing rain after such a long time without it! The lawn is still brown and crispy but the borders are looking much happier. My vegetables are thriving and we’ve had bumped crops of chillies, peppers, cucumbers, tomatoes, strawberries and rhubarb. How has your garden been this July? I’m very lucky to be joined by Ann from Gardening limited. You have two lovely ladies running this amazing link party and two sets of reasons to join in! Ann is a Pinterest queen so all posts will get twice the amount of linky love. If you are not sure how and why to link up, read this post Here. This month we have changed things up a little and each month, Ann and I will choose a featured post from the previous link up to highlight. This blogger will receive extra linky love with more sharing of the post on social media at the end of the month too. We will also feature our favourite photo from the new Instagram Community who are using the hashtag #MyGloriousGardens. It’s always tricky to choose a featured post but I have chosen a post by Nic over at Nip it in the bud. The link to her post is HERE. It’s a heartwarming post about gardening with family and neighbours and what we can learn from each other; a real community spirit. I love that Nic involves her children on her allotment and that her neighbour, Henri, harvests from a grape vine he brought over as seeds after the Second World War. How wonderful for Nic’s children to learn all these stories first hand! Thank you Nic for joining in with our linky. It’s always fun to read great posts. I’ve fallen back in love with Instagram! Ok, there’s a lot of follow/unfollow business going on but some of the photographs of gardens and flowers are amazing this month! If you’d like to join in, just add the hashtag #MyGloriousGardens to your photos and Ann and I will find you. 1. Link up to 3 posts when the party goes live at 7am on 1st August. It will be open for 2 weeks. 2. Tweet your post and tag @oldhouseinthes1 @gardenlimite for a retweet. 3. Read and comment on both of the hosts posts and the post linked before yours. 4. Comment on as many other posts as you would like to spread the linky love. 6. Come back to the next link party to see if your post was featured. Ann is developing a featured badge as we speak! 7. Join in over on Instagram and use the new hashtag #MyGloriousGardens for a chance to be featured. That’s it! Time to get linking. Click on the word INLINKZ just below and follow the guide to link your posts. *By linking up, you agree to your link being visible and accessible via the list of linked blog posts, to us sharing your posts on social media (tagging you as relevant), and to us sharing your post on our sites if chosen as a feature. By using the tag #MyGloriousGardens on Instagram also means you may be featured. thank you Sophie. 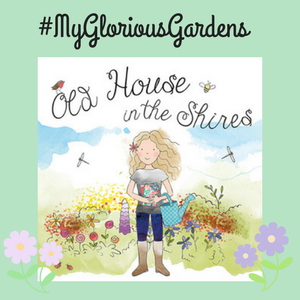 I’m thrilled to have been featured and happy to have found the #MyGloriousGardens linky. Thank you for the feature, Sophie! I am glad that, like me, you loved the dahlias right as they were opening. Today I shared some of them already opened. Hope you like them! I’m so happy to be joining in this month’s link party! I’ve been having a tough time keeping to my posting schedule over the past few months. Life has it’s way of getting in the way! Anyway, I’ve added 1 link so far, maybe I’ll add another…. I’m about to start reading through the others featured. Always lovely to have you Emma! Thank you for joining us and i’ll Look forward to reading your post.